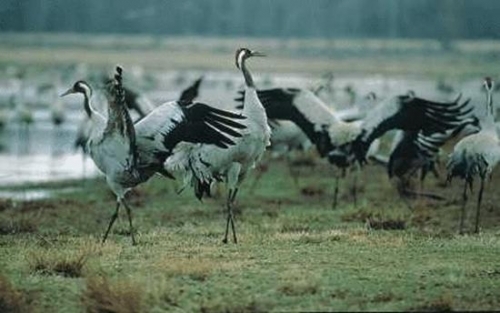 The Eurasian Crane Grus grus (hereafter Crane) is one of the most majestic and distinctive birds in Europe. So many aspects of its lifestyle lend themselves to human curiosity and affinity; its graceful pair bonding display dance, its large size and bipedal stance and fashionable plumage, its streamlined V formation flight in flocks and its noteworthy annual return to specific undisturbed wild wetlands for a long breeding season. The Crane has been totally lost from Ireland for so long, circa 3oo years, and was probably disappearing from local areas for hundreds of years before that. The embers of its cultural footprints, for such a totemic bird, have almost been quenched. But several strands of recent human focus, by numerous individuals in a variety of fields, have begun to unwittingly bellow the embers of the story of the Crane in Ireland. Our earliest hunter-gatherer and agrarian ancestors had an intimate understanding of their landscape. And maybe, if we look carefully at our cultural heritage we may discover essential clues regarding our natural heritage. If we in Ireland rediscover an understanding of wetlands, could we dream of hearing the clarion sounds of a group of Crane flying high over the midland bogs or watch the mystical display dance of Cranes in a forest swamp at the head of the Shannon flood plain?